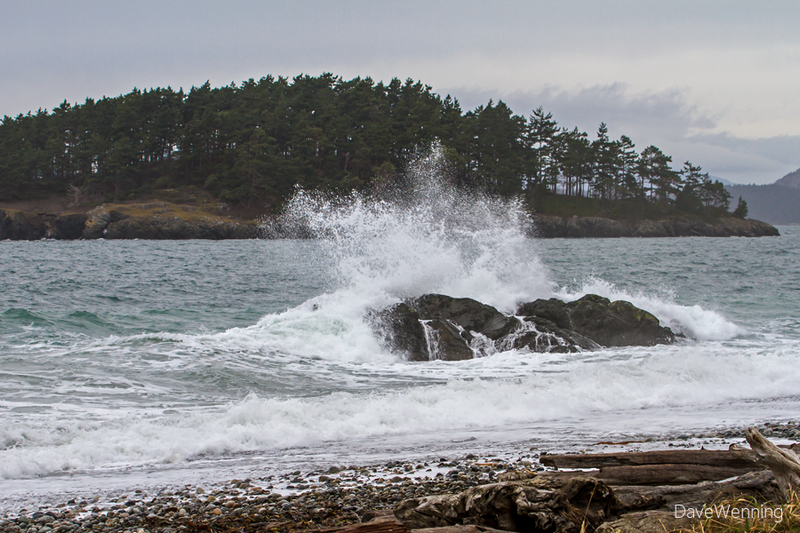 I was back in Deception Pass State Park yesterday morning. I parked at East Cranberry Lake near the main entrance and hiked around the lake to West Beach on the Strait of Juan de Fuca. When I got there, the waves and surf really caught my attention. 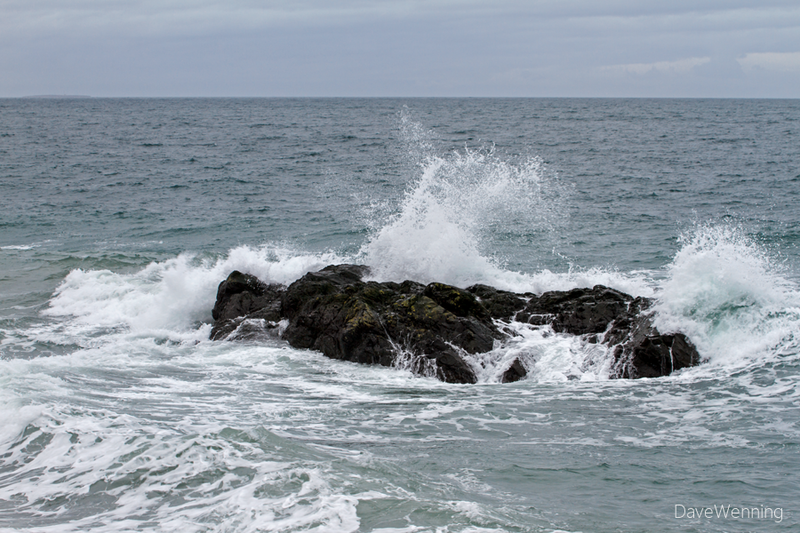 Despite relatively calm winds, waves hitting the rocks were creating some spectacular displays. There was apparently residual effects from the previous day's storm still in play. Although the site is 95 miles/153 km from open ocean, the Strait of Juan de Fuca can behave like ocean because of its size. The spectacle got me thinking about waves. Why was this happening with only a slight breeze blowing at the time? Wind waves are produced when wind blows over and disturbs the surface of a body of water. The height of the waves will be determined by the velocity of the wind, the distance the wind travels (fetch) and the duration of the gust. In the absence of wind, gravity will restore the water surface to the resting or still water level. So, with only a slight breeze blowing, why are such big waves rolling into West Beach? Locally, wind waves tend to die out when the wind stops. This is what happens where I live on Skagit Bay. Far out in the ocean, however, large storms with sustained winds produce heavy seas, wind waves radiating out from the center of the storm. Wind velocity, fetch and duration conspire to produce really big waves. These will last much longer even after the wind has died. The waves will gradually organize themselves into swells that can travel hundreds of miles. 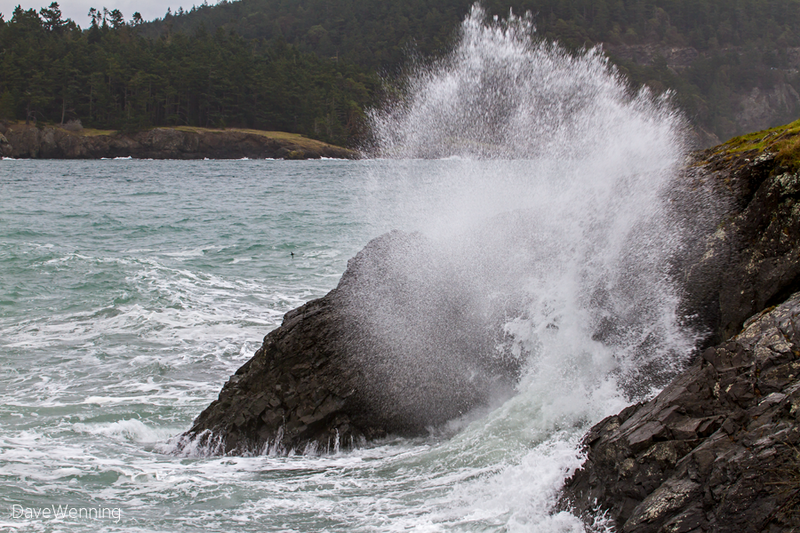 On the Washington coast, swells can reach 10 to 30 feet/3 to 9 meters in height. 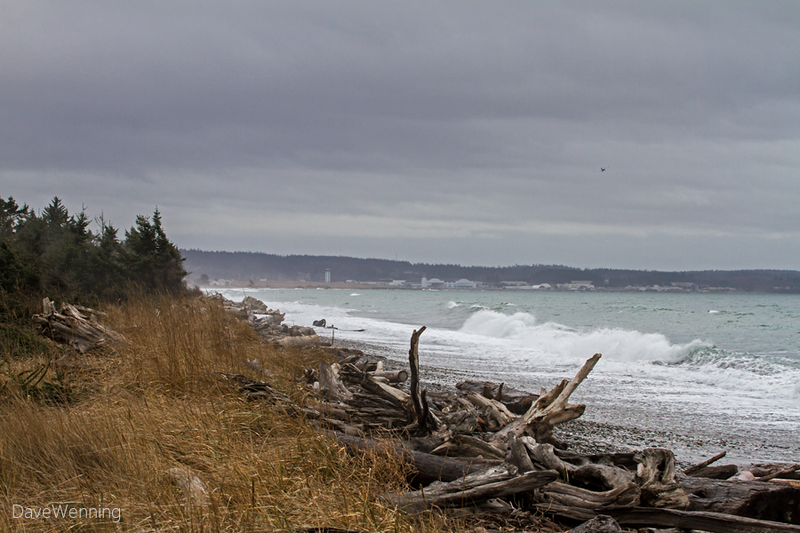 These swells can travel down the Strait of Juan de Fuca until they crash against the shore at West Beach. They will be much diminished after their journey, but standing on the shore, it is possible to see them rolling in. 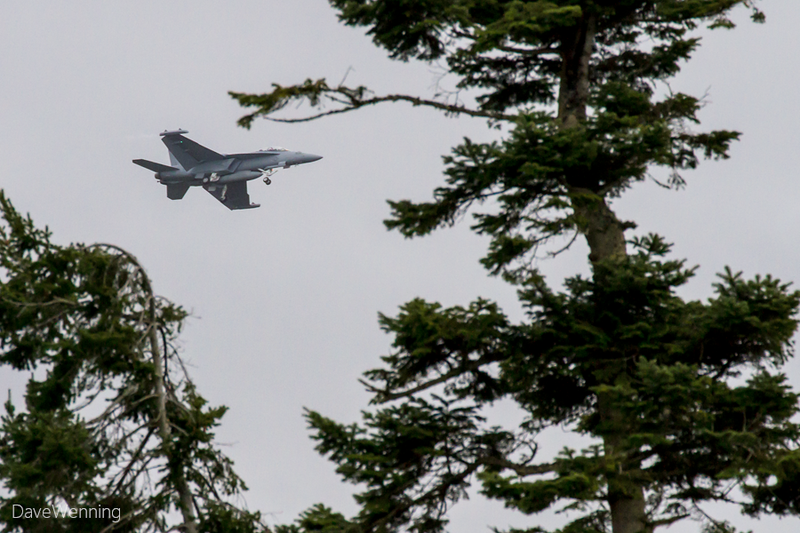 Speaking of sound waves, the EA18-G 'Growlers' from NAS Whidbey Island were out exercising over the park. Looking towards the Naval Air Station, waves reaching West Beach become breakers. Breakers form when the wave reaches shallow water, roughly half the wavelength or less in depth. There was heavy overcast, typical for winter here, but no rain. This kind of overcast can produce challenging light for photographs. There were no sea birds resting on "Fraggle Rock" this day. (That's the name I coined for this West Beach feature, not the official name.) Even the hardy creatures that live in this environment must have found a more inviting place to spend the morning. 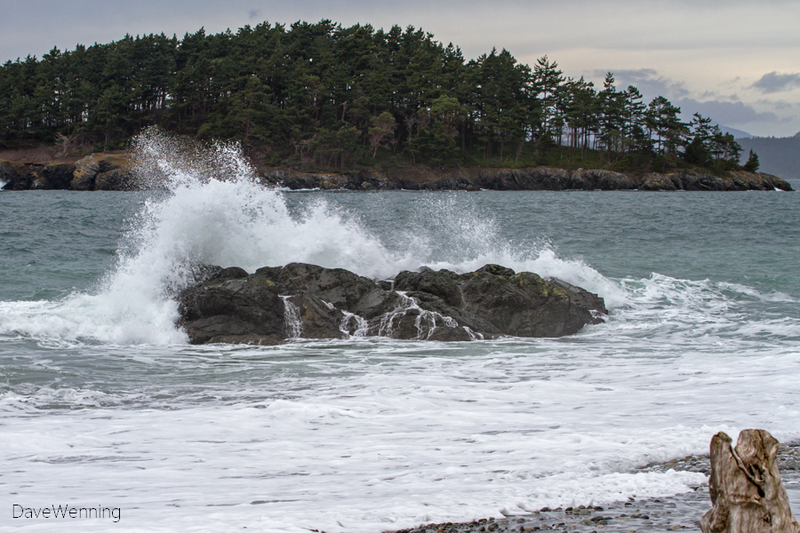 For me, it was a very pleasant day to be outside, on dry land, hiking the trails in Deception Pass State Park. First Day 2014: The Best One Yet!